The virtual evaporation of the dividends of an intricately built peace process in Kashmir with a small yet emotionally laden skirmish on the Line of Control (LoC) , following a well kept nine year long ceasefire , has prominently endorsed the commanding importance of Kashmir as ‘the’ issue which needs to be resolved if India and Pakistan have to move forward in forging a mutually beneficial future. The border clash amply exhibited how a carefully crafted Indo-Pak detente can give way to extreme acrimony and saber rattling coming with the suddenness of a bolt out of the blue. The shots in anger across the LoC were fired after a lapse of over nine years of cease fire. It was in November 2003 that the guns fell silent in Kashmir as India and Pakistan started looking for a way forward from the political and military impasse that had descended on the Region following the roll back of Operation Parkaram in Oct 2002. Indians had initiated the largest ever mobilization of forces onto Pakistan’s border following the attack on the Indian Parliament on 13 Dec 2001. During the heightened tensions the hawkish elements made it obvious that India wanted to exercise its hypotheses of limited aggression in Pakistan including Kashmir by launching treatises of hot pursuit. The Indian aggression was only deterred when Pakistan made it obvious that any bid for adventure would bring into consideration the nuclear dimension as a last resort for protecting its national integrity. The dangerous stand off aptly underscored the importance of resolution of Kashmir Issue if South Asia was to know lasting peace. 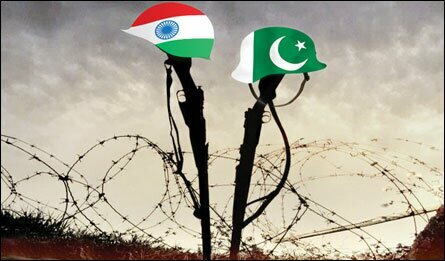 The stalemate ushered in endeavors for normalization which culminated into the Indo-Pak summit in Islamabad in Jan 2004. It saw launching of the Composite Dialogue Process; manifestly built around the core issue of Kashmir. The underlying idea was that Kashmir being such an emotive issue it was in the fitness of things to prepare ground for ultimate cutting the Gordian Knot. Emphasis was to be laid on initiating confidence building measures by resolving less contentious issues first to build up momentum and prepare political environments for reaching a realistic and enduring solution of Kashmir. The track record of this process has amply demonstrated that despite best and determined efforts of the Pakistani interlocutors we are no closer to even discussing the peripheral questions towards resolving the Kashmir Issue. The much trumpeted pursuit of CBMs has yielded little if nothing and the few crossing points on the LoC which keep opening and closing with many hiccups have hardly borne any fruits in harmonizing people to people contacts in Kashmir. The whole exercise has only manifested the Indian reluctance to discuss Kashmir Issue with Pakistan. As the border incident has shown Kashmir still maintains the dominating position in deciding the fate of the Indo Pak relations. The Indians may think that stonewalling on Kashmir is only cementing their hold on the wailing vale but in effect strong undercurrents are generating new trends and ripples that are hard to ignore. The all pervasive Indian tyranny in Kashmir has unleashed the collective resistance of the people who have begun to understand the power of non violent resistance and undertaking efforts for exposing the Indian tyranny to the outside world. During 2008 a benchmark was reached when the efforts of Association of Parents of Disappeared Persons (APDP), through its own investigations resulted into discovery of one thousand graves which are believed to contain bodies of the victims of fake encounters , enforced disappearances , torture and other abuses whom the Indian security forces had killed and then dumped. The September Eleven incident has erased the line separating the freedom fighter from a terrorist and this has provided India with a handle to portray alienation of Kashmiris with Indian occupation as a foreign sponsored movement employing terror tactics. This has also enabled India to get away with the grave human rights violations it is perpetrating in Kashmir. One has to also take it into account that in the course of armed resistance spread over two decades the Kashmir landscape has been thoroughly bruised and traumatized. The evolving non violent mass resistance movement in Kashmir is in step with the global dynamics and reflects their impact in shaping local ground realities. The developments in Kashmir augurs well but still Kashmiris need our earnest support in highlighting the Indian atrocities that are the bitter staple of life under Indian occupation. The Kashmiri armed resistance was being waged by around 1500 freedom fighters, operating in IHK at the peak of insurgency. Yet to neutralize this modest number of freedom fighters the Indians have physically deployed seven hundred thousand troops who occupy every nook and corner of cities and hamlets and crisscross the forests turning the landscape into a virtual jail. Around one hundred thousand Kashmiris have lost their lives during twenty years of conflict and 8000 – 10000 people have simply vanished after arrest by the security forces. The Indian Armed Forces employ infamous Special Operations Group, an officially patronized band of local collaborators, to perform the dirty job of extra judicial executions. The culture of fake encounters thrives whereby innocent locals are killed and dumped in nameless graves as Pakistani militants and cross border terrorists to enable their killers to claim gallantry awards and promotions. The Kashmiri armed struggle by a small number of freedom fighters has played a major role in keeping alive the hopes of throwing away the Indian yoke for over two decades. Their struggle has been rewarded in a way that while they were few in number in challenging the might of the Indian state now the entire Kashmir stands awakened. Kashmiris are losing the fear of the Indian bayonet and embracing the power of mass non-violent resistance to assert their will. They have also managed to keep alight the flame of armed resistance in face of tremendous odds. On the Solidarity Day this year we eloquently endorse these endeavors and recommit ourselves to supporting the valiant struggle with a renewed vigor and with all means at our command.